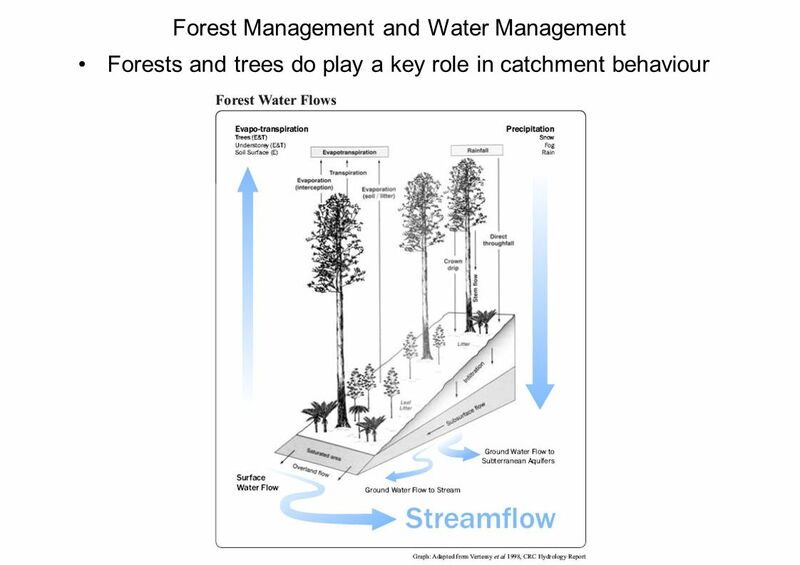 Forests and trees do play a key role in catchment behaviour Forests have a major impact on the water cycle within a catchment. 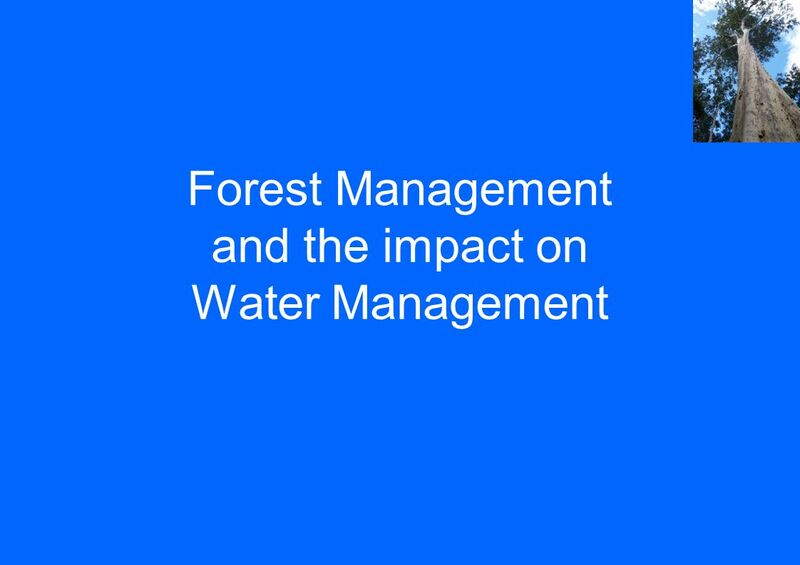 Forest ecosystems provide for a major filter on water flow within the catchment. Infiltration processes provide clean water for streamflow. Interception and evapotranspiration use large amounts of the rainfall. 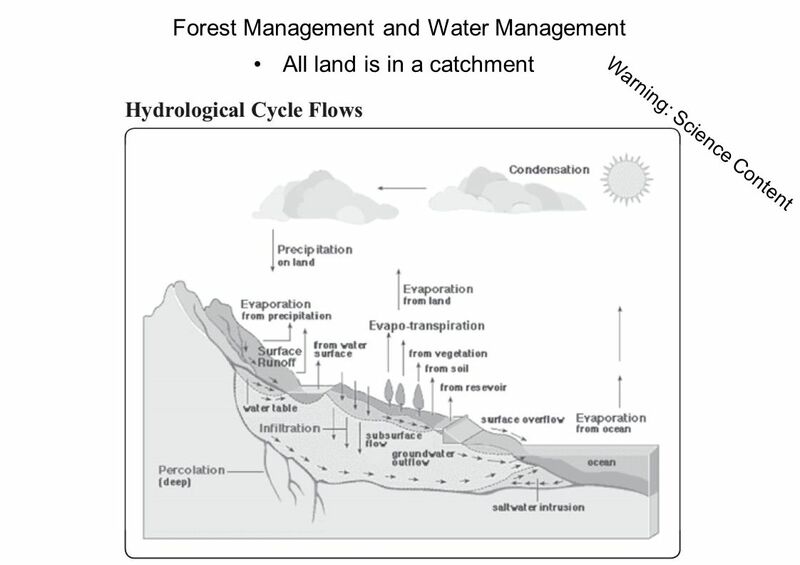 Forest type and forest age do determine the amounts of water used and the runoff. 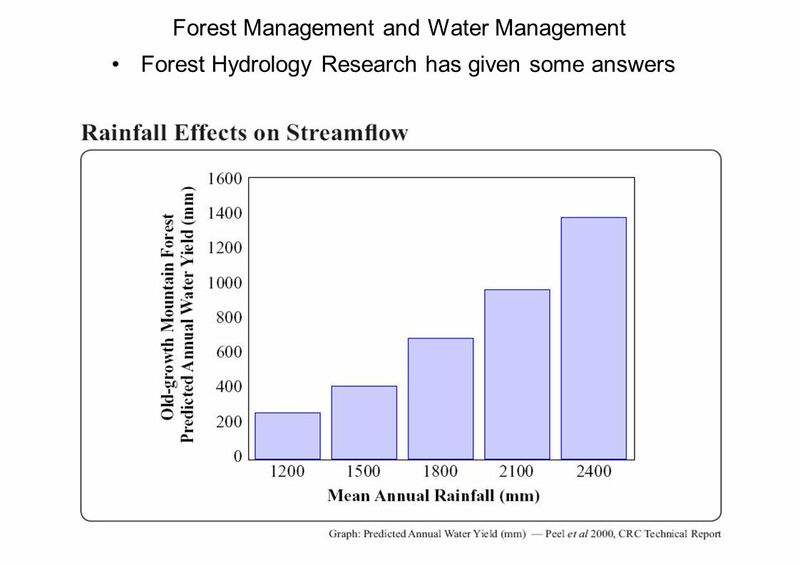 Forest Hydrology Research has given some answers Rainfall is an important variable that is ignored in the current debate. Trees use proportionally more water when it is drier and can yield more water when it is wet and there is an excess to tree requirements. Naturally water is more scarce in drought conditions. Forest Hydrology Research has given some answers Tree age is an important variable and is the only focus in the current debate. It is not just the tree age that determines the amount of runoff but interrelationships between understorey, soil Litter and interception. 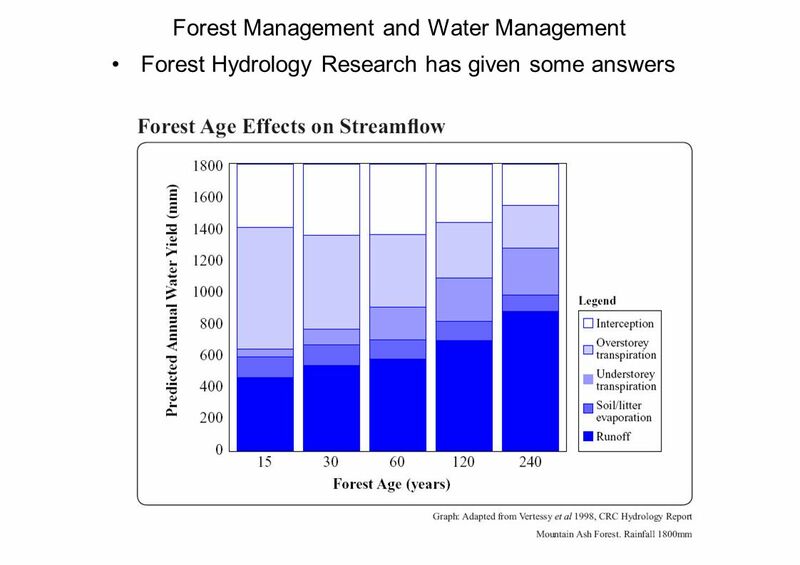 Forest Hydrology Research has given some answers This is the now famous relationship between forest age and stream flow yield. It has been misused by applying it to all forests and plantations in all environments. The original research was in 8 calibrated sub catchments dominated by Mountain Ash on deep krasnozem soils. It explained the lower stream yields observed after the 1939 forests turned much of some catchments into regrowth forests. It shows that if water yield is your only objective and it must be maximised then you must avoid having young forests in your catchments. How do Mountain Ash Forests grow and flourish? The life cycle of a mountain ash tree is attuned to the natural environment it occurs in. The life cycle starts with bud initiation and then bud development. Flowering is in Autumn with pollination by insects and birds. The fruit matures over winter and ripens in summer. Seeds are retained in the fruit for a number of years and in the absence of a wildfire progressively open or fall from the tree. Seed germinates in bare soil and ash beds. Seed does nor germinate in litter or in shade. Germination is in Autumn and Spring. Early growth of dense seedlings is rapid. Trees exhibit regrowth properties of rapid height growth and pointy crowns for more than 60 years. Mature trees produce a secondary crown of large branches from the trunk. Over mature trees begin losing crown elements and develop hollows essential for many wildlife species. The life expectancy of dominant trees is 200 to 400 years. The 400 year old trees we need in 400 years time are germinating today. The trigger for Mountain Ash forest renewal is wildfire Wildfire provides Heat to open fruit capsules immediately after the fire Ash bed seed bed with access to mineral soil Removal of competing vegetation Removal of canopy to allow additional light to soil surface Removal of aleopathic responses Flush of nutrients in ash for early growth Wildfires are a key part of the cycle of life for mountain ash forests. Wildfires in the natural state start when lightning strikes a tree. The old fire killed stages are a common target. During drought conditions there are large amounts of dry fuel available. Fires spread rapidly. 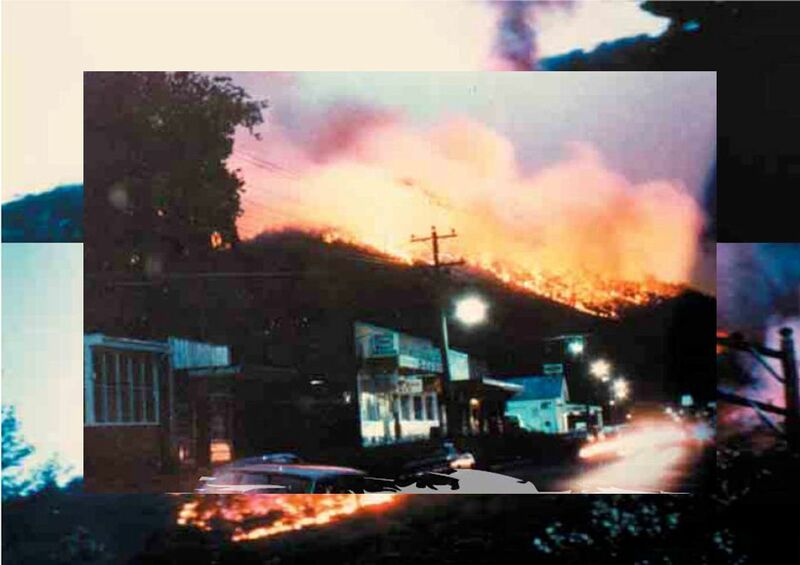 This is the Ash Wednesday 1983 Warburton fire shortly after ignition and then spreading rapidly up Mt Little Joe. This is the same fire later the same day from Warburton. 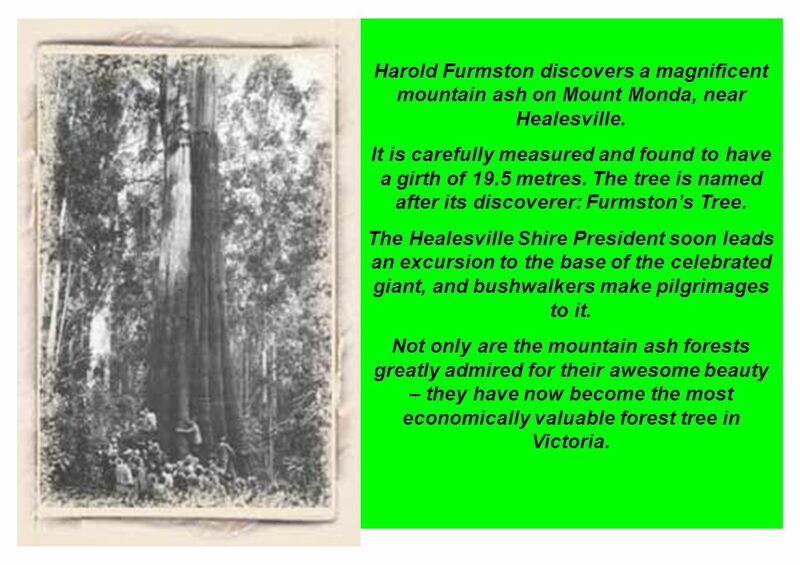 12 Harold Furmston discovers a magnificent mountain ash on Mount Monda, near Healesville. It is carefully measured and found to have a girth of 19.5 metres. The tree is named after its discoverer: Furmston’s Tree. The Healesville Shire President soon leads an excursion to the base of the celebrated giant, and bushwalkers make pilgrimages to it. Not only are the mountain ash forests greatly admired for their awesome beauty – they have now become the most economically valuable forest tree in Victoria. 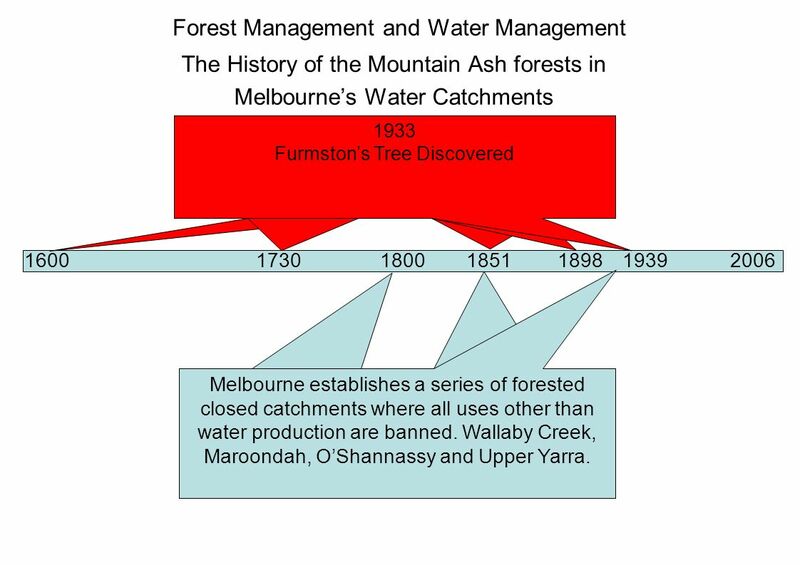 The History of the Mountain Ash forests in Melbourne’s Water Catchments 2000 The Furmston Tree collapses at the end of its life Great Dividing Range Fires burn to the edge of the catchments and strategic firebreaks established to prevent fires entering the catchments. Period of successfully excluding wildfire from Melbourne’s water Catchments Black Thursday A great fire sweeps across a thinly populated Victoria Black Friday Massive fires sweep through the catchments killing large areas of Mountain Ash and establishing regrowth forests Wildfires burn through Wallaby Creek. 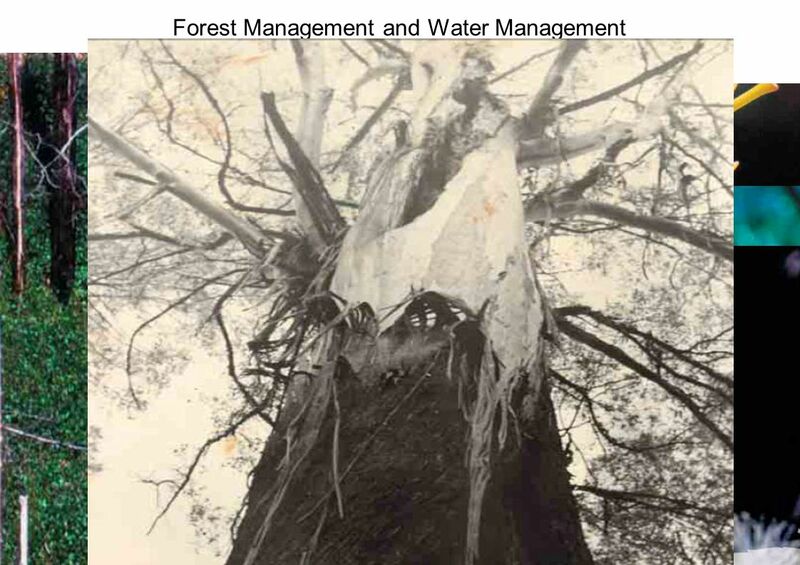 The resultant forest of Mountain Ash is now known as the “Big Ash” containing some of the tallest trees in Victoria. Red Tuesday 12 people die and 1500 homes lost as fire sweep through the Gippsland forests Wildfires burn through the ranges east of Melbourne and a seedling forest of Mountain Ash is established. One of these seedlings will become the giant Furmston’s Tree. 1600 1730 1800 1851 1898 1939 2006 It is inevitable that the catchments will burn at some stage over the next 100 years. Melbourne builds its first dam at Yan Yean Melbourne sources its water from the Yarra River above Dight’s Falls Catchments declared as National Parks giving water and conservation objectives. Only Thomson and Yarra Tribs. remain with multiple use objectives and are open for visitors. Melbourne Board of Works notice reduced water yield from catchments. Commission major hydrological studies and catchment monitoring network. 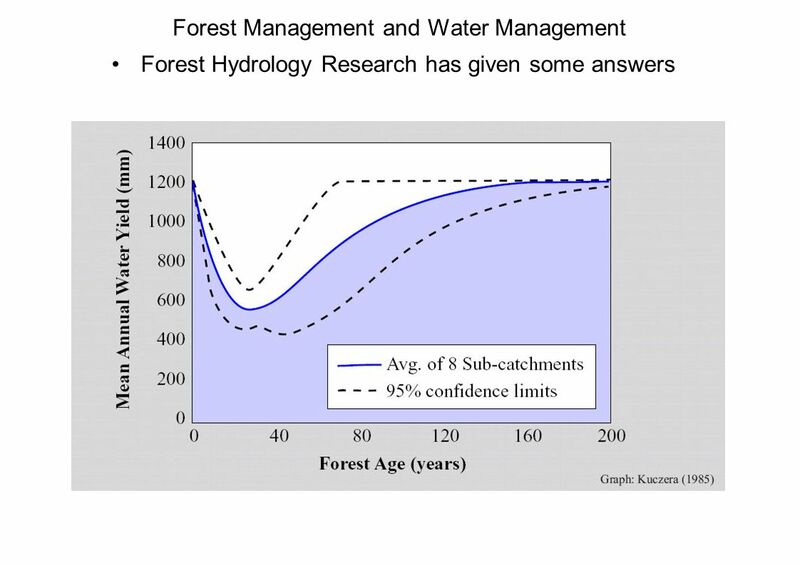 Relationship between water yield and forest age determined and policies adopted to exclude fire from all catchments. 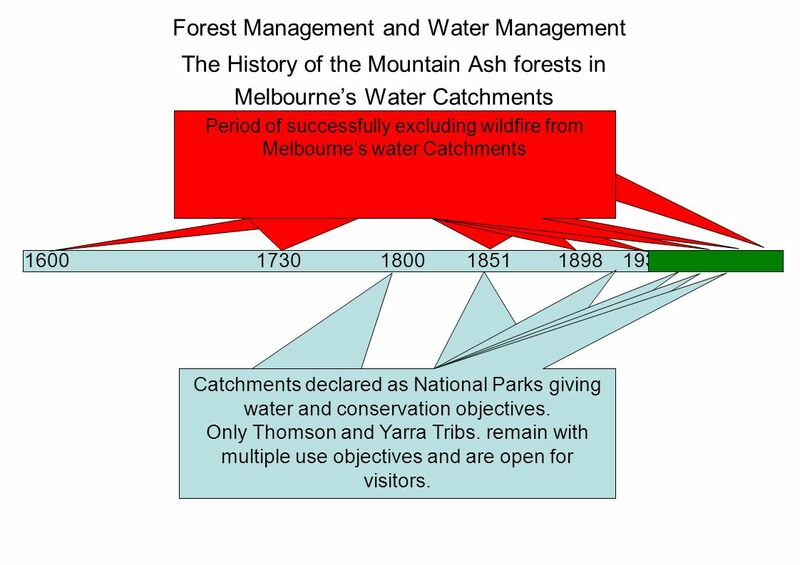 Melbourne establishes a series of forested closed catchments where all uses other than water production are banned. Wallaby Creek, Maroondah, O’Shannassy and Upper Yarra. 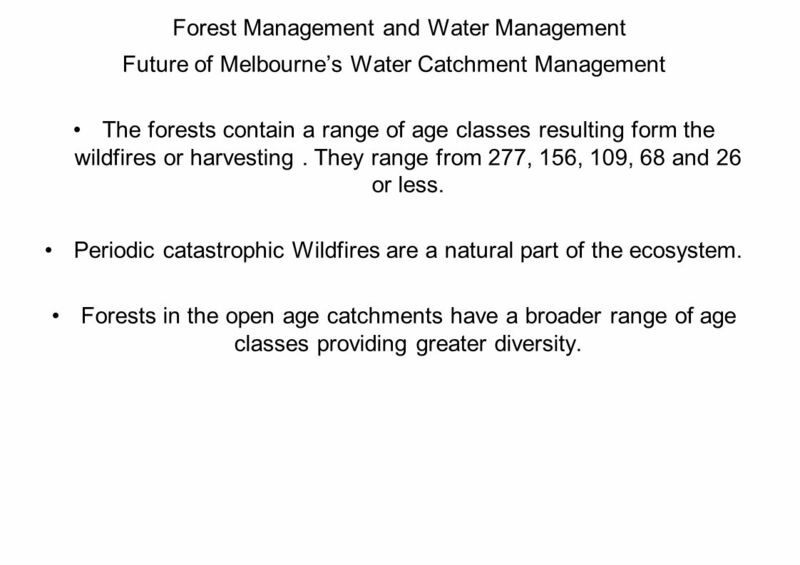 Future of Melbourne’s Water Catchment Management The forests contain a range of age classes resulting form the wildfires or harvesting . They range from 277, 156, 109, 68 and 26 or less. Periodic catastrophic Wildfires are a natural part of the ecosystem. Forests in the open age catchments have a broader range of age classes providing greater diversity. 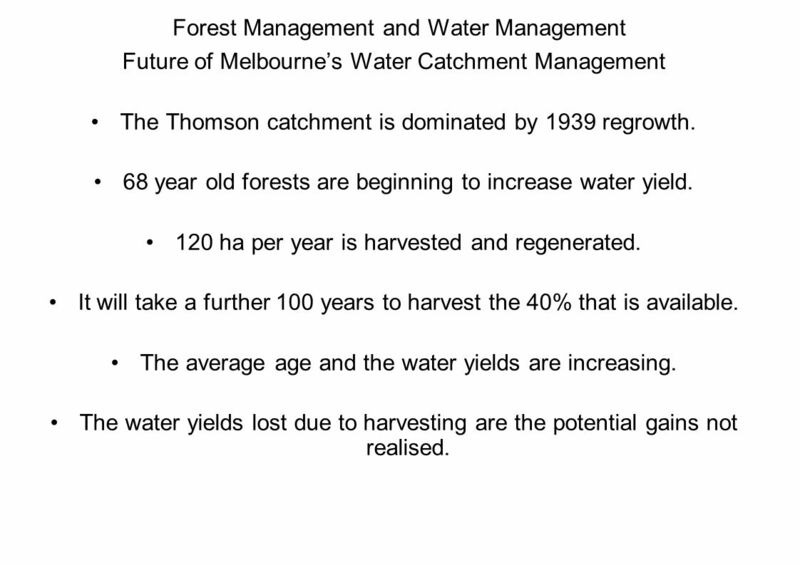 Future of Melbourne’s Water Catchment Management The Thomson catchment is dominated by 1939 regrowth. 68 year old forests are beginning to increase water yield. 120 ha per year is harvested and regenerated. It will take a further 100 years to harvest the 40% that is available. The average age and the water yields are increasing. The water yields lost due to harvesting are the potential gains not realised. 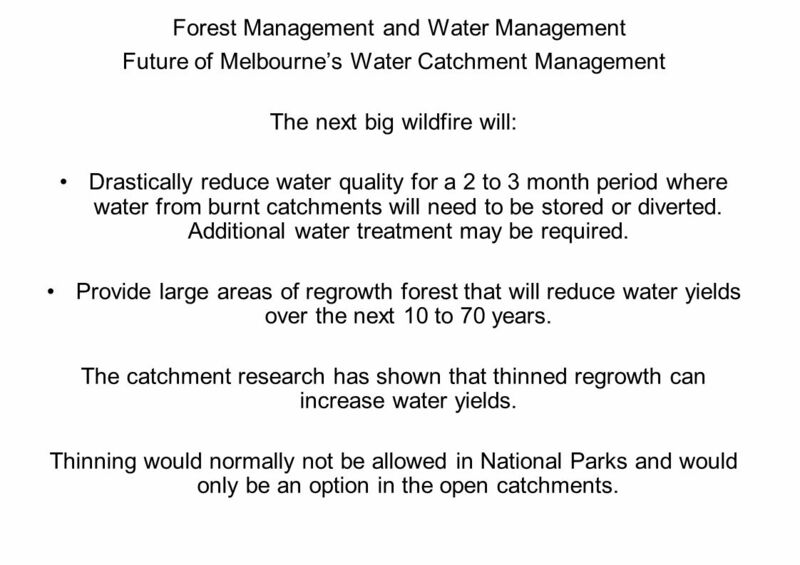 Future of Melbourne’s Water Catchment Management The next big wildfire will: Drastically reduce water quality for a 2 to 3 month period where water from burnt catchments will need to be stored or diverted. Additional water treatment may be required. Provide large areas of regrowth forest that will reduce water yields over the next 10 to 70 years. The catchment research has shown that thinned regrowth can increase water yields. Thinning would normally not be allowed in National Parks and would only be an option in the open catchments. What is being done elsewhere? WA Water Corporation has adopted Security through Diversity water supply policy. Wungong catchment is 13,000 ha of dry sclerophyll forest. 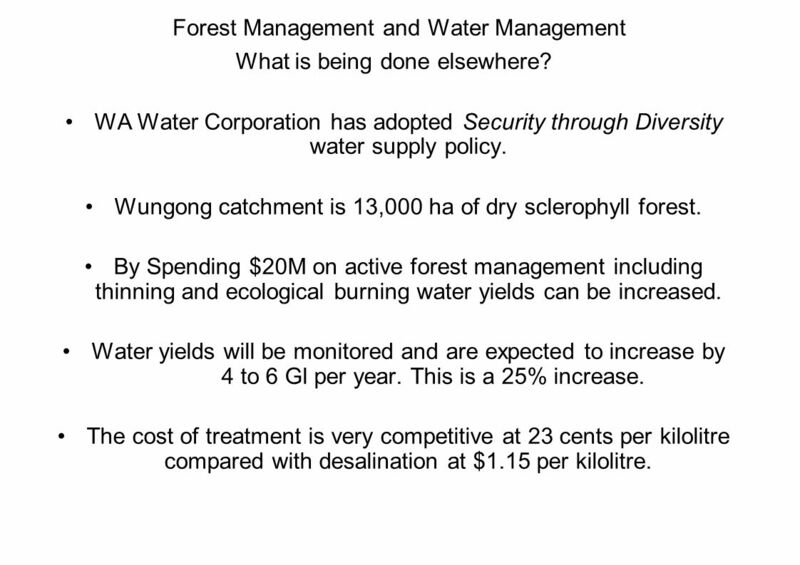 By Spending $20M on active forest management including thinning and ecological burning water yields can be increased. Water yields will be monitored and are expected to increase by 4 to 6 Gl per year. This is a 25% increase. The cost of treatment is very competitive at 23 cents per kilolitre compared with desalination at $1.15 per kilolitre. 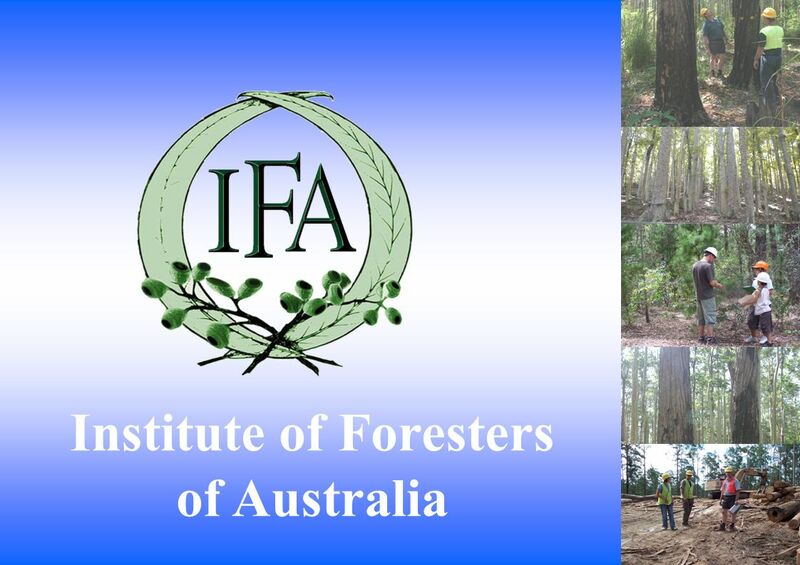 Forest Management is not just about timber harvesting. It is about knowing what the forest needs and managing it so that it can provide what we as a community need and that includes water, biodiversity and timber. Download ppt "Institute of Foresters"
Evidence of God In His Creation Genesis 1: Reasonedtruth.com Genesis 1:9-13. Management and Use of Forests. Managed Woods proper management results in greater and more uniform growth than when trees are permitted to develop according. Our Natural Resources, Then and Now What is a natural resource? Any form of energy which can be used by humans. Those things that people come in contact. “How much soil is being lost from the fields in Tarland each year?” This is a very valid question since the soil is the farmer’s principal agricultural. 1 11 “…to raise new ideas and improve policy debates through quality information and analysis on issues shaping New Hampshire’s future.” Board of Directors. South America Amazon Rainforest. The World’s Rainforests Rainforests cover 7% of the Earth’s land surface. The world’s tropical rainforests are home to. Ecology Challenge Directions: After each question, write your answer on a separate sheet of paper. You will be given about 30 seconds per questions. The. Let’s recap… definition of a resource and a region importance of water as a resource in Australia geographic characteristics of the Murray-Darling Basin. Outcome 2 Factors Influencing Contemporary Societal Relationships with Outdoor Environments Outdoor and Environment Studies Unit 3. Victorian Wildfires: Implications for sustainable harvesting of native forests Presentation to ABARE Outlook Conference Canberra Tuesday 2 March 2010 Michael. Bushfires By Marli Dale. 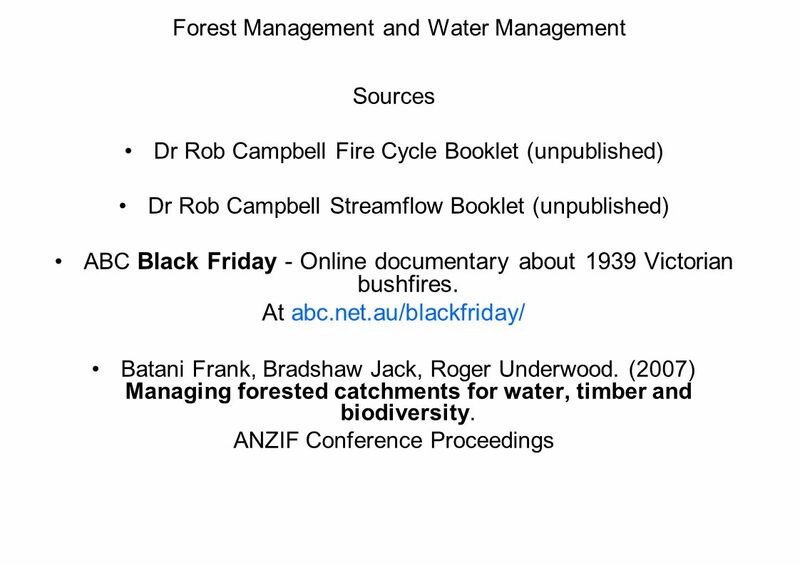 Contents What is a bushfire? 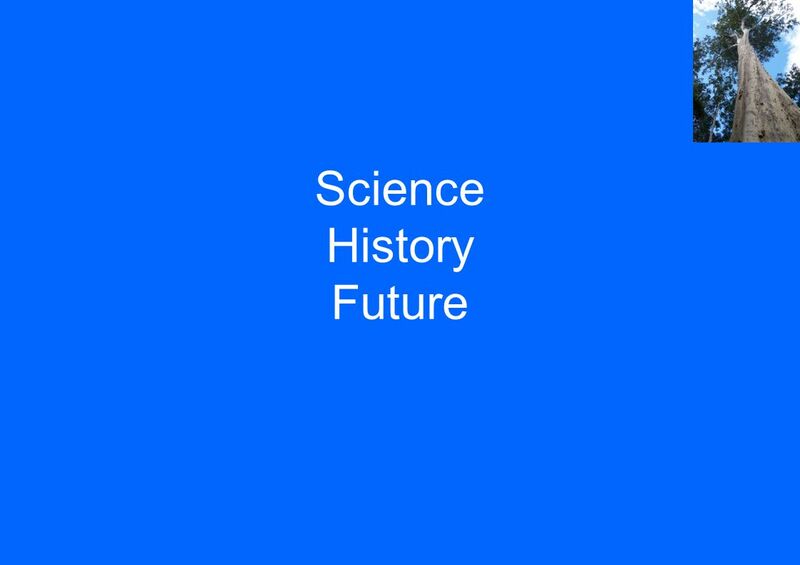 1 The impact on communities 2 Bushfire History 3 How has science helped ? 4 Response & Recovery.